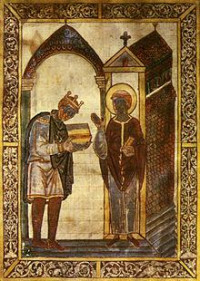 Æthelstan or Athelstan (Old English: Æþelstan, Æðelstān, meaning "noble stone"; c. 894 – 27 October 939) was King of the Anglo-Saxons from 924 to 927 and King of the English from 927 to 939. He was the son of King Edward the Elder and his first wife, Ecgwynn. Modern historians regard him as the first King of England and one of the greatest Anglo-Saxon kings. He never married, and was succeeded by his half-brother, Edmund.